I did not pick the computer life. It picked me. I can remember the summer between kindergarten and first grade; I had a computer summer class that introduced me to my passion. The first day when my mother picked me up I exclaimed “mommy I want a computer for Christmas!” I was five and had no realization that in 1986 they would cost more than about everything I owned. I remember being upset that Santa did not bring me the computer that I had been wishing for since June. Growing up, any time I got the chance to sit in front of a computer, I took it for as long as I could. In high school, I even designed the website of one of the groups I was in. It was still online up until last year when CCHS did a website redesign. However, I never actively pursued a career with computers or even took a class for them since that summer. It was not until after I got into WordPress that I actually took a computer class, and now I have an associate’s in Information Technology. My first career was as a preschool teacher. I loved teaching, loved the joy that it gave me, but it was a very under-valued career. Most teachers, who go to college to become teachers, make anywhere between minimum wage to a dollar over that with no insurance and maybe a week’s paid vacation. While spending 45 plus hours every week, I was dedicated to teaching our future, I was barely getting bills paid. So many times I would have to pay bills late, worry how I was going to make sure the next bill gets paid, and have enough gas in my car to make it to work the rest of the week. I devoted twelve years to teaching colors, shapes, letters, numbers, and how to get along with others. While I loved to teach, I needed more. Plus, if I wanted to be able to take care of my daughter, I needed to make a change or I would never even be able to have a savings. Around 2011, I got the idea that I wanted to write a blog. I had heard my friend Chris talk about blogging so I knew he would point me in the right direction. At that time he was working on a security plugin to help the sites he managed for work. He told me “if you want me to help you build a blog, I’m going to teach you so you can do it on your own later.” We bought a domain, set up hosting, and ran the install. I instantly became hooked. The more I built, the more I wanted to learn about WordPress, and the more I wanted to do. 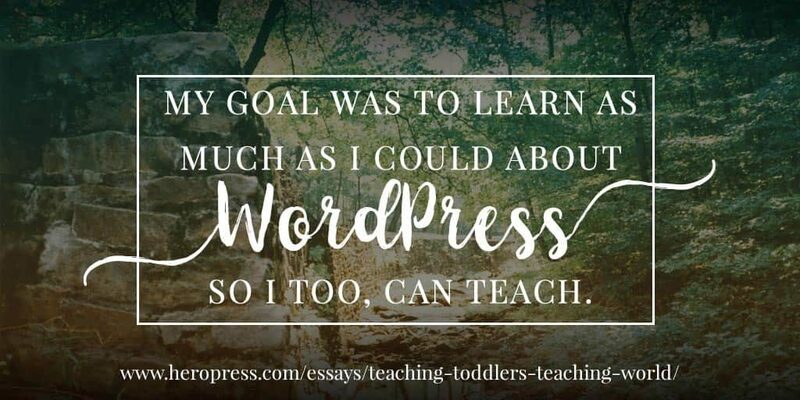 Almost every night, after my daughter would go to bed, I would spend working on my blog, reading about what one can do with WordPress, and trying everything I learned. Sometimes things would go great, and other times I would accidentally delete out my entire site on FileZilla without a backup and would start from scratch again. Most of my learning came from my failed attempts and what not to do. That is what was my first clue that I would like to be a “fixer” instead of a “builder”. The more I learned, the more I wanted to learn. By 2013 I decided that “I could actually do this. I could make money from WordPress” but I still had about zero clue of how to go about it. I decided to leave preschool for good. I took a full time job working for a local IT agency that also built sites on WordPress. I spent a year there but during that time Chris introduced me to Regina at WP Security Lock. We hit it off and I quickly became a part time employee in April of 2014 helping her with the sites she managed and then learning how to clean hacked websites. I spent almost two years working for WPSL. The first part of them I was working for the local agency. Regina showed me another option for working in WordPress. It was the idea of working remotely. My daughter was still at the age where she needed after school care, and it is expensive. So with the support of my then fiance, I took the leap to work remotely in September of 2014. Fast forward from working in with various plugin support teams and security support roles, to jumping into agency support that I did for almost a year, I am now at home with WP Media on their WP Rocket support team. While most do not feel that it is the most glamorous of career choices, I love fixing problems, finding solutions, and helping people. Most of all, WordPress and working with support, gives me many teaching opportunities to help out every person who asks. My first ever WordPress Community event was WP Engine’s 10 year birthday party they threw for WordPress in Austin. The feeling the Austin WP community gave me led me to feel like this was really a place I wanted to be. After Chris saw how excited I was about the community, he asked if I would like to go to WordCamp Chicago. Coincidentally, four years ago today, I was attending my first ever WordCamp. How the speakers taught the attendees, my goal was to learn as much as I could about WordPress so I too, can teach. Even though I no longer had the official title of a teacher, I still loved to teach. WordCamp Austin 2014 gave me the first opportunity to teach others about Jetpack. I was a nervous wreck! Not only was my best friend there who I looked up to in the WordPress community, but also one of the wonderful Happiness Engineers for the Jetpack team. I had Kraft go over my slides for me to make sure there was not anything I was sticking my foot in my mouth for and away we went. Afterwards I had people coming up and thanking me for explaining Jetpack in a way they could understand. After that WordCamp, I wanted to speak at all WordCamps. One of the many advantages of working for companies that have roots in the WordPress Community is that they allow me to attend, speak, and volunteer at WordCamps. I now have over 20 speaking opportunities under my belt, and have no want to stop for the unforeseeable future. I love having any opportunity to teach. I have now grown from only speaking at WordCamps to teaching beginner’s WordPress at our local community college, writing a book on beginner’s WordPress, and starting WP Kids Slack group to be a resource for KidsCamps and teaching our youth on the value and joys of WordPress. Now I am proud to say that I have taught WordPress to all ages from children to the baby boomers and it feels great! I have even had the opportunity to teach my own daughter WordPress and she loves going to the WordCamps. She has even helped others at Camps which for me is what it is all about. It is such a delight teaching Kids Camps and seeing their creativity blossom while building a site of their own. Plus, getting youth and teenagers interested in WordPress, coding, design, and more ensures that what we are building now, will only become better in the future. The post From Teaching Toddlers to Teaching the World appeared first on HeroPress.